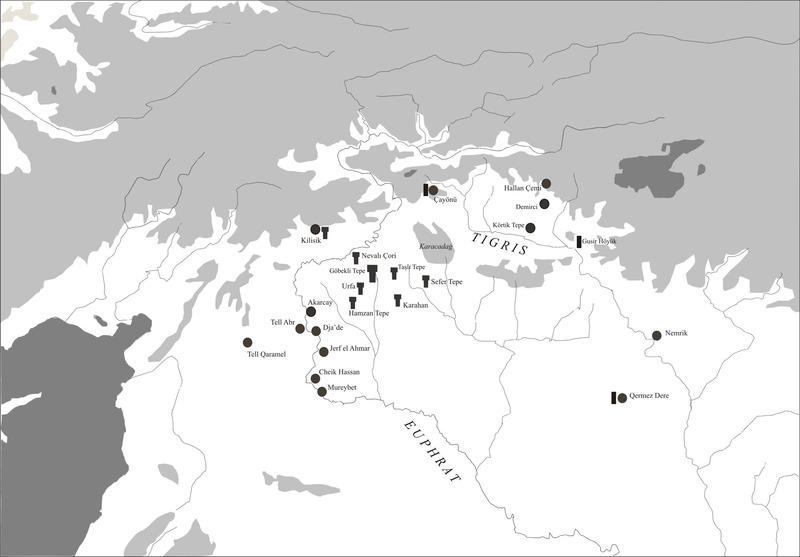 Current distribution of sites with T-shaped pillars and with simple limestone stelae (modified after Schmidt 2006; Copyright DAI). The characteristic element of Göbekli Tepe´s architecture are the T-shaped pillars. In the older Layer III (10th millenium BC) the monolithic pillars weigh tons and reach heights between 4 m (pillars in the stone circles) and 5.5 m (central pillars). The T-shape of the pillars is clearly an abstract depiction of the human body seen from the side. Evidence for this interpretation are the low relief depictions of arms, hands and items of clothing like belts and loinclothes on some of the pillars. Often the pillars bear further reliefs, mostly depictions of animals, but also of numerous abstract symbols. Layer III is supraposed by layer II, dating to the 9th millenium BC. This layer is not characterised by big round enclosures, but by smaller, rectangular buildings. The number and the height of the pillars are also reduced. In most cases only the two central pillars remain, the biggest measuring around 1,5 m.
T-shaped pillar visible on the surface at Karahantepe (Photo: D. Johannes, Copyright DAI, Schmidt 2006, Fig. 94). The large pillars are so far only known from Göbekli Tepe. This may change over time however, as there now are several sites that show smaller pillars, resembling those of Göbekli Tepe´s younger layer. T-shaped pillars resembling the smaller examples from Göbekli Tepe’s Layer II were first recorded at the settlement site of Nevalı Çori. 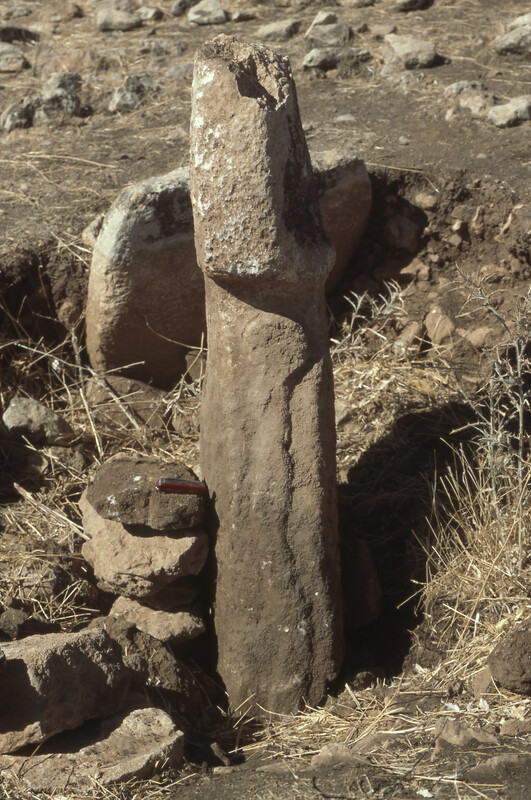 Several more sites in the near vicinity of Göbekli – Sefer Tepe, Karahan, and Hamzan Tepe – are known to have similar pillars, but no excavation work has been carried out so far. With the Neolithic site of Urfa-Yeni Yol, which seems to have revealed a small T-shaped pillar in the course of construction work in that area, with Taşlı Tepe, and with Gusir Höyük three more related sites were added to this list recently. A further addition to the sites with T-shapes is the so-called Kilisik statue, that closely resembles the general pillar form but has more naturalistic features [find a text by Marc Verhoeven on this find here – external link]. While most sites concentrate in a rather small radius around Göbekli Tepe, Gusir Höyük in the Turkish Tigris region [more information – external link] has considerably widened the distribution area of circular enclosures, however the pillars discovered there are slightly differently shaped – they seem to be missing the bar of the T. Similar stelae have been discovered in Cayönü and Qermez Dere. As only Gusir Höyük has been excavated, nobody can tell at the moment what the other sites might hide. Çelik, Bahattin. 2011a. “Karahan Tepe: a new cultural centre in the Urfa area in Turkey.” Documenta Praehistorica 38: 241–253. Çelik, Bahattin. 2011b. “Şanlıurfa—Yeni Mahalle.” In The Neolithic in Turkey 2. The Euphrates Basin, edited by Mehmet Özdoğan, Nezih Başgelen and Peter Kuniholm, 139–164. Archaeology & Art Publications, Istanbul. Çelik, Bahattin, Güler, Mustafa, Güler, Gül. 2011. A new Pre-Pottery Neolithic settlement in southeastern Turkey: Taşlı Tepe. Anadolu / Anatolia 37: 225-236. Karul, Necmi. 2011. “Gusir Höyük.” In The Neolithic in Turkey 1. The Tigris Basin, edited by Mehmet Özdoğan, Nezih Başgelen and Peter Kuniholm, 1–17. Archaeology & Art Publications, Istanbul. Karul, Necmi. 2013. “Gusir Höyük/Siirt. Yerleşik Avcılar.” Arkeo Atlas 8: 22–29. Moetz, Fevzi K. and Bahattin Çelik 2012. “T‑shaped pillar sites in the landscape around Urfa.” In Proceedings of the 7th International Congress on the Archaeology of the Ancient Near East, edited by Roger Matthews and John Curtis, 695–703. Harrassowitz Verlag, Wiesbaden.